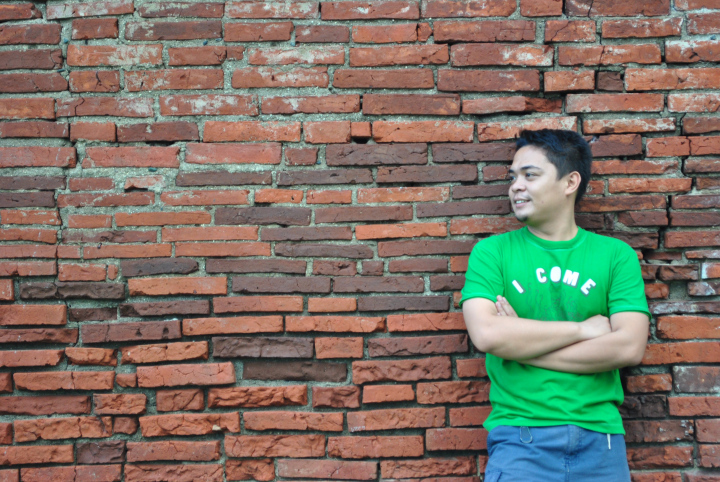 Che started backpacking around the Philippines in January 2009. She was inspired by the hike to Mt. Pinatubo in Zambales that year. It was the same volcano that killed 800 people in 1991; a tragic narrative forever etched to our national consciousness. But what Che has learned in Pinatubo is that just like our country, there is beauty beneath the rubbles. In an archipelago made up of 7,107 islands, Che was determined to find all the good things that would redeem whatever tragedy that had befallen us. And on May 2012 — the tragedy that had befallen her. The love of her life just broke her heart. But there was still the rest of this beautiful country to see – and the rest, perhaps one, in the 98 million people to meet. Che had only known Angel Pascual as the friendly face in her former office, giving her his spare doughnuts whenever they would ride the same bus home. They were not friends, they were, as everybody are at first – strangers. She was busy traveling and moving on from her relationship, while Angel was happy with his longtime girlfriend and climbing up the corporate ladder as an IT messaging engineer. There was no reason for them to cross each other’s paths again. But with all the bad things that the Internet has to apologize for, it did one wonderful thing: to reconnect the two of them. “I have been looking for her blog for a long time, and when I found it, when I was looking at her pictures, alam ko gusto ko rin gawin yung ginagawa niya. I needed space that time, time to think, to reassess myself and then i decided to send a message, kung puwede naman ba kong sumama sa trips niya,” Angel said, telling the story of how they re-met. When he sent that message, he was not at all looking for love. He had also just ended his five-year relationship and all he needed was to do the things he had always wanted to do – to travel, to seek adventure, and experience life from the off-beaten tracks of a beautiful country. On the other side of the screen, Che was recognizing the friendly face. It took her no more than two minutes to respond with a casual “sure, you can join me in one of my trips.” As a blogger, she wasn’t new to these kinds of messages. A lot of people before Angel had asked to tag along, but nobody ever followed through. In a work of cosmic powers, something urged Che to send one more message. “I have an upcoming trip to Siquijor and a sidetrip to Dumaguete.” It was the first time she was sending an actual invitation. Angel was only able to respond the next day. And it was to say he had booked his tickets. “Na-stress ako ‘nung sinabi niyang na-book na niya. Inisip ko, “naku naku saan siya matutulog, tapos lalaki pa siya, hindi ako sanay sa stranger. Pero naisip ko, budget-wise kailangan ko ng kasama sa trip, at mayroon pa kong taga-picture,” Che recalled. 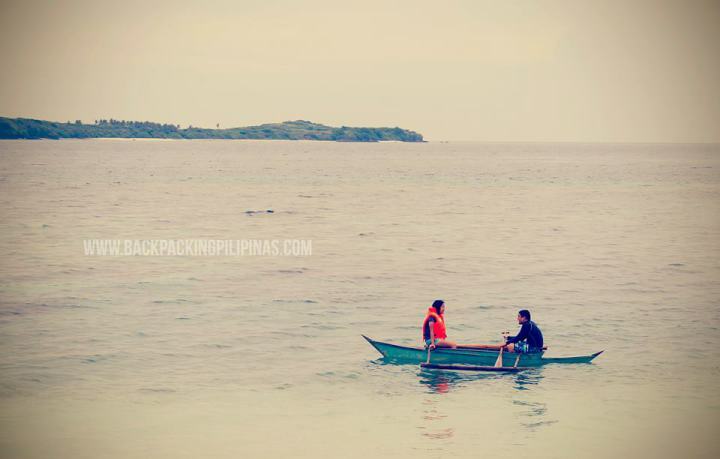 On October, 2012, they went for a weekend trip to Siquijor and Dumaguete. It has the constant whimsical sound of the ocean kissing the rocks and the fresh air gathered from the accumulation of trees around the area. “I don’t think it was awkward, it was smooth, but it wasn’t romantic. It was just a beautiful travel of two people,” Che said. Sparks weren’t flying yet, but there was enough chemistry to continue with the journey. 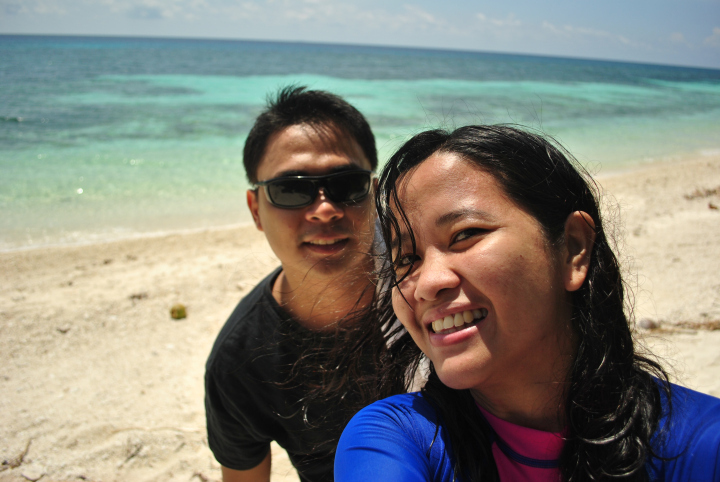 After Siquijor and Dumaguete, Angel tagged along again to Sorsogon. 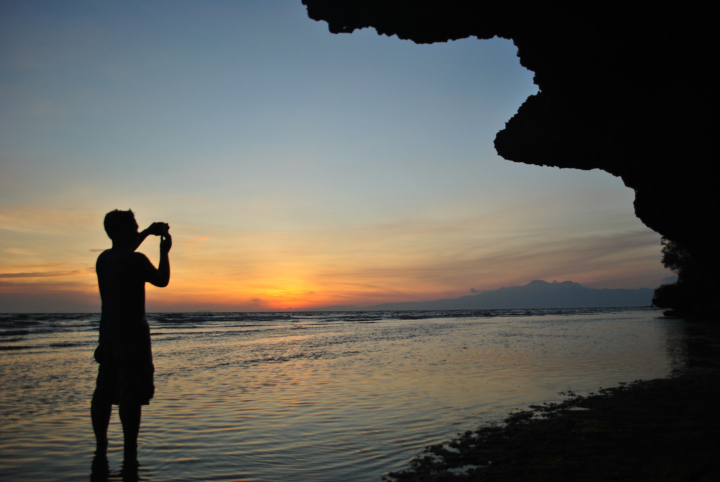 “I knew I can’t surf, but in Sorsogon I realized, kaya ko pala. Pati sa Siquijor, nilibot namin ‘yun in one day with just a bike, usually I don’t do that. Pati yung umakyat kami ng burol para lang makakakain ng masarap na halo-halo, that was priceless,” Angel said. Needless to say they became travel partners. Che went on to explore more places and Angel went with her. Angel drove 8 hours a day for 5 days around Luzon with Che. 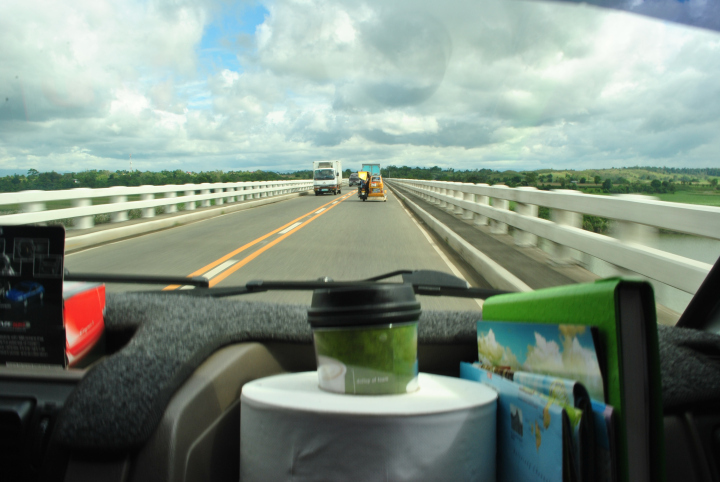 They got around to planning a 5-day road trip around Luzon. They would split the cost and Angel would be the designated driver. He would drive 8 hours a day, sometimes more, and he would drive through the darkest of nights in outskirts believed to be hubs of rebel groups, but he drove and he drove because they had places to reach. Che had places she had to reach, and Angel was determined to take her there. 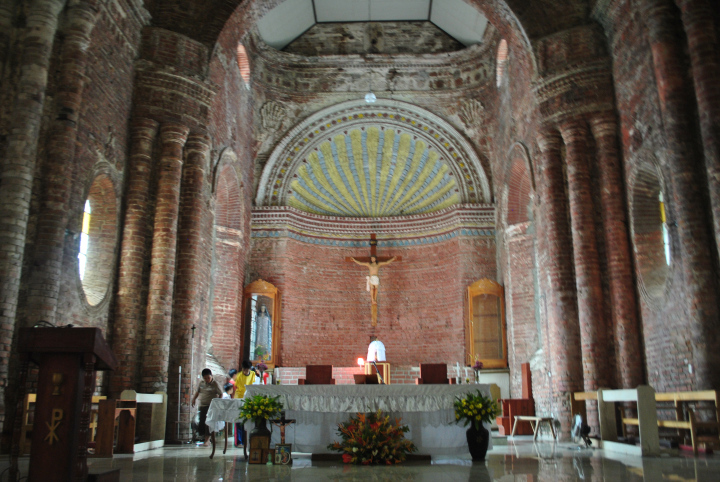 “What stood out for me in that Luzon trip was this one rainy day in Isabela, we were church-hopping and I had to take photos for my blog, si Angel wagas talagang nagpapayong sakin,” Che said. He got his answer when they reached Occidental Mindoro. 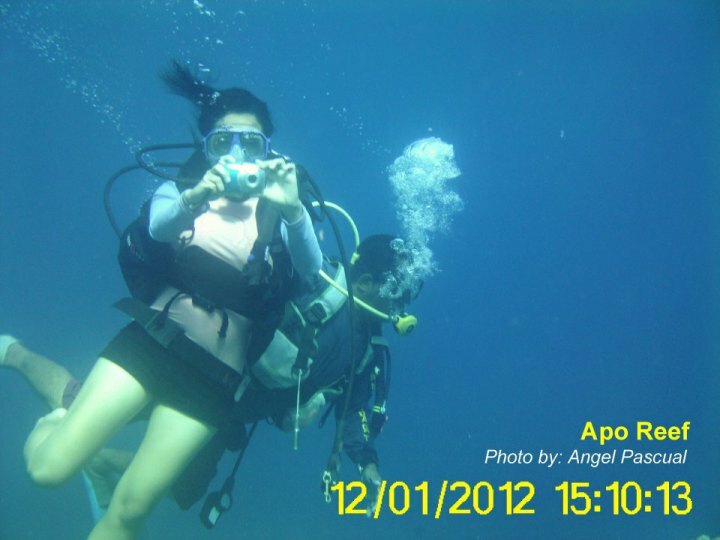 They went diving at the mystical Apo Reef. It was both their first time to dive. When it was Che’s turn, Angel realized she would want a documentation of it. Che was wearing her tank, but impulsively, wanting to take a video of her, Angel dove in with just his snorkeling gear. Confused with how he felt for a girl who used to just be a stranger, Angel reviewed photos and videos from their five days in Luzon. He came to the video of Che under Apo Reef and was startled to find out that the video lasted for 4 minutes and 40 seconds. “I can stay under water for 4 minutes and 40 seconds just shooting her. And that was the time I realized, it’s the things that I couldn’t do before, and now I do them just because of her. I am a person who wants to push his limits, but I couldn’t do that before. I tried to go swimming before but I couldn’t, and I kept myself in that cave for so long,” Angel said. With Che, Angel went over and beyond his limits. He swam with turtles in Apo Reef. He flirted with the giant waves while surfing in Guiuan, Eastern Samar. He climbed the steepest mountains in Tawi-Tawi. He chased the most enchanting water falls in Surigao del Sur and South Cotabato. The pristine beaches of Tawi-Tawi. 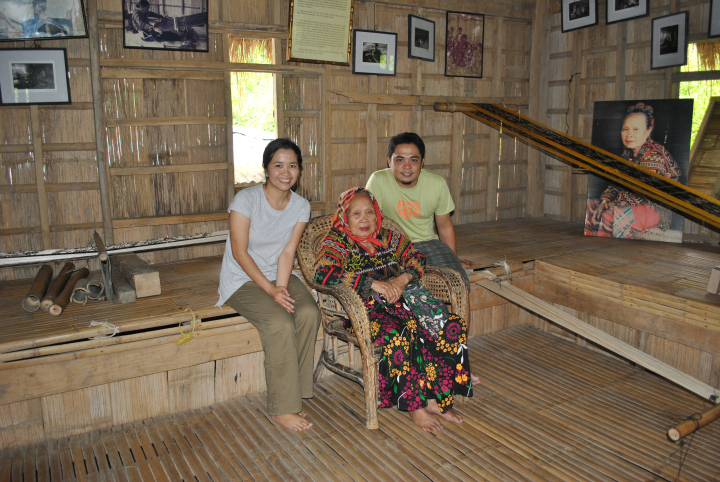 In South Cotabato, he also braved the back-breaking trek through rolling hills and mountain forest just to reach Lake Sebu and discover the stories of the Ancient South. There he met the now departed Lang Dulay of the Tboli tribe and the beautiful leader of the Tnalak dream weavers. Tnalak is a known masterpiece in the Philippines, it is a Tboli cloth woven out of abaca fiber and natural dyes. It is said that that the intricate designs of the Tnalak come to the women in a dream. It is their coming-of-age ritual and a sign from the goddess Fu Dalu that they wait for as young girls. When they finally dream of Tnalak, they are ready to weave. The story is as romantic as two strangers meeting and falling in love. Except that Che did not come to Angel in a dream. He was wide awake and all he had to do was to get her. Lang Dulay of Lake Sebu. In Marinduque, which local folklore says was a heart-shaped island that emerged from a spot in the ocean where lovers Marin and Duke drowned themselves in a Romeo and Juliet-like tale, Angel stopped the world for both her and Che. During sundown, at the shoreline in the middle of the heart of the Philippines, he finally said the words that have been trying to come out in the endless pauses they take while climbing mountains and traversing terrains, the words that fill the air of silences they shared in the many sun rises and sun sets they witnessed together, and the words that describe the side glances in the long and winding roads they have traveled, three words: I love you. 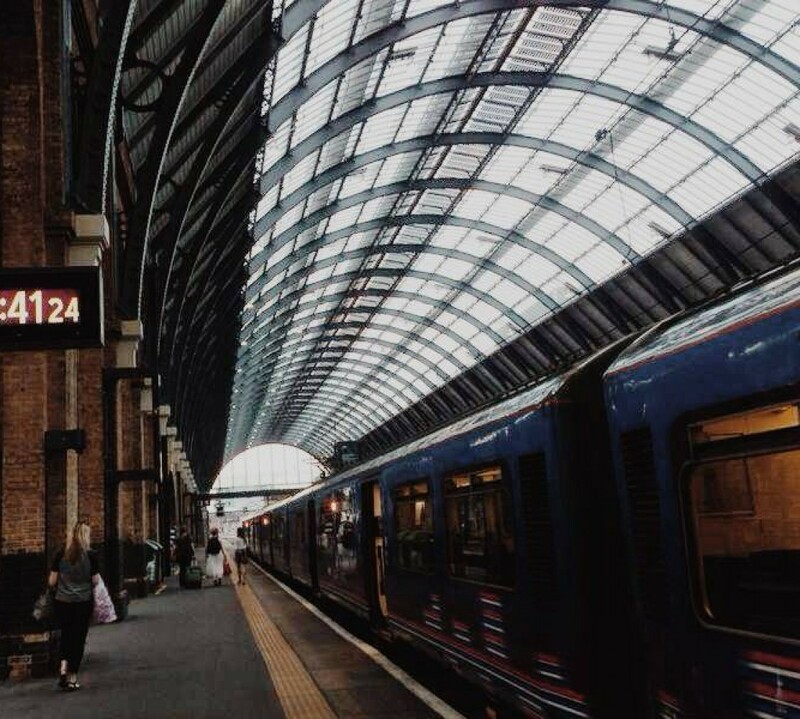 They would travel more after that, no longer constrained to not saying I love you, no longer second guessing the brief touches of hands, now with the certainty to hold them, with the certainty of closing in on the space that had served as their comfort zone in the places they went to together. “We were both in long term relationships, but we realized the length of the relationship wasn’t a factor. We were comfortable, some have been together for 10 years and they don’t feel that comfort. We felt it, we were good,” Angel said. “Angel braved the oddest and most notorious places just to help me fulfill my 80-province challenge. But more than that, it just comes down to whether you love the person; and if you love the person just the way he is, there are no more complicated things,” Che said. In the middle of her journey to completing the 80 provinces, Che embarked on another mission. She wanted to help with literacy in the most far-flung areas, islands which were rarely reached by government resources. 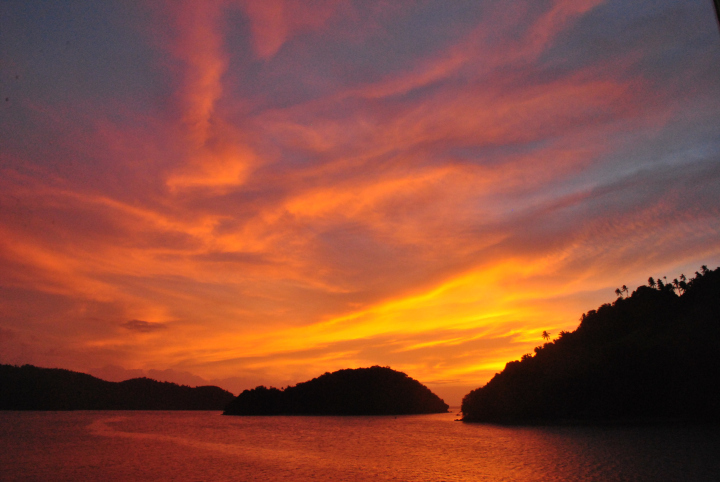 “The Philippines has amazing sights, beautiful churches, immaculate sand beaches and colorful festivals. But there is an ugly face that lie hidden in my travel snapshots – the plight of underprivileged children. I thought that if we could put books on those tiny hands and get them inspired to read, understand and explore the idea that there is more to life than just their daily scarcities, maybe there could be hope to pluck this country out of this tragedy we call poverty,” Che wrote on her blog when she launched BookSail, an initiative with her closest friends to brave the seas and bring books to students. On June 2013, Che, Angel and their friends went to a small fishing village in the remote Palumbanes Island in Catanduanes, Che’s hometown. The books and school supplies were donated by their friends as well; some would donate modest amounts to help with the transport cost of those books and supplies. Their travel expense to the island was shouldered by the volunteers. It was so that what little money they get from donors would go entirely to the children. 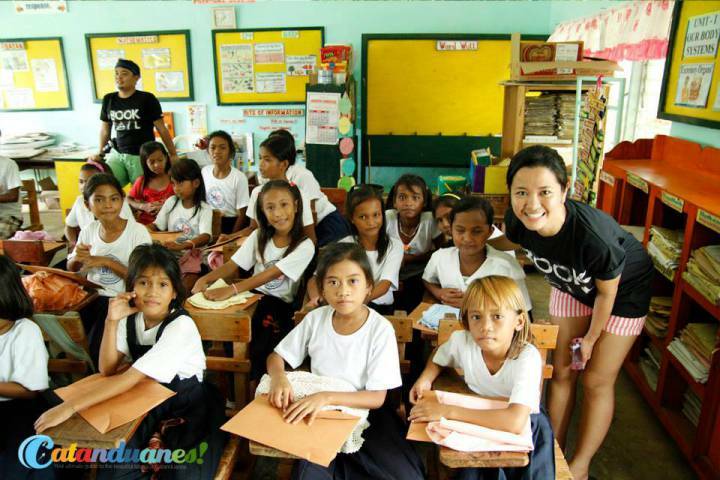 They were able to give 333 students in Palumbanes books and school supplies. BookSail in Palumbanes Island, Catanduanes. It was also around that time that Che and Angel got to talking about getting married. Before they met each other, they already entertained the thought of settling down. Unlike their sunset-filled love story, the narrative of their proposal was more simple. Neither of them remember how exactly it happened. Perhaps for two people meant to spend the rest of their lives together, grand gestures don’t matter, rings and speeches and even the date no longer bear weight, because the moment Che said yes to Angel to travel to Siquijor, they had already started their tale. Because when things make sense, and it is easy, and you are sure of what you feel, as Che said, “there are no more complicated things,” and the decision to commit to somebody for a lifetime would just be a matter of where and when and whether you have leaves from work. A walk to the aisle in a white wedding dress would just be to share it with everybody else, a chance for the cynics to believe that there is true love. “Che is a good leader. Take BookSail for example, for us it is just a group. It means so much more to her. She can get books, she can arrange all that, and I’m a good follower. I need a good leader so I knew she was the one for me,” Angel said. “I was at a point in my life where I was ready for a lifetime commitment. I have helped my family, I was able to get the dream job that I had hoped for for decades, I have traveled the Philippines, I was ready to come home. I was home,” Che said. There were 202 children in the far-flung island of Limasawa in Southern Leyte who also needed help. They had no library of their own, and each grade level only had one textbook to share among them. They were making do with dilapidated books destroyed by Super Typhoon Haiyan, and no matter how Che loved Angel, they were more important than a wedding. Angel admitted to having fights over it. But he had to put his feelings aside. 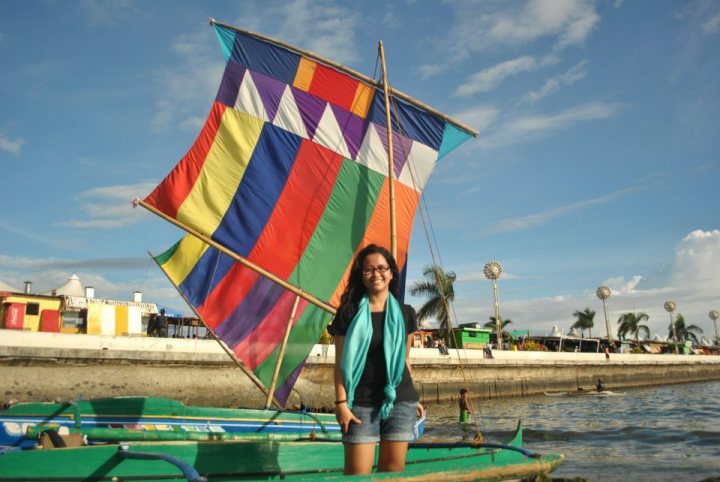 On Labor Day this year, after much troubles and conflicts, BookSail successfully reached Limasawa Island in Leyte. The books they collected are now on the shelves of a library named after them. 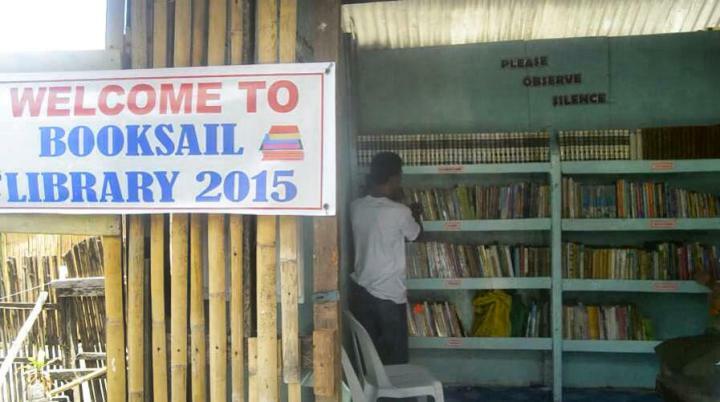 The BookSail Library in Limasawa Island, Southern Leyte. “You said, kapag kinasal tayo, tayo lang ang magiging masaya, ‘yung mga pamilya natin at ‘yung mga kaibigan lang natin ang masaya. Pero kapag nagbigay tayo ng libro sa Limasawa, mas maraming bata ang magiging masaya. 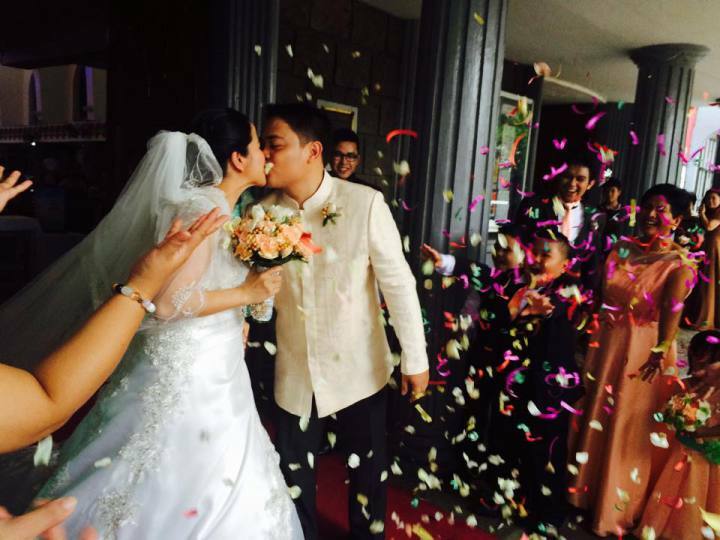 And I couldn’t be more proud of that,” Che said in her wedding vows when she finally married Angel last June 20 in a quaint Church in Quezon City. Che said that Angel has taught her many things. How to be more organized, for one; Angel helps her be more focused, and keep things in order. It is one of the many things that convince her that she has finally found what she has been looking for in the ins and outs of 80 provinces. “You make me a better person by helping me, teaching me and loving me. Until today, the day I said I love you, the day I said I want to marry you, those were the best days of my life,” Angel said in his vows. It is true what Che wrote on that tearful flight from Davao. The world will not stop for a girl with a broken heart. Three years later, she may look back and be glad that it didn’t. For when the world turned, her destiny unraveled. Because in a world we live in full of doubts and fears, we root for those who had found certainty, we cheer for the people who make love appear as an honest, sincere and this truly magnificent thing we had stopped believing in, but should start aspiring for again. They inspire us to give it another chance. “Hindi siya inapurang istorya ng buhay, I had to go through seasons in life to reach this point,” Che said. And if we’re lucky, we just might fall in love and find that the world can turn in our favor. 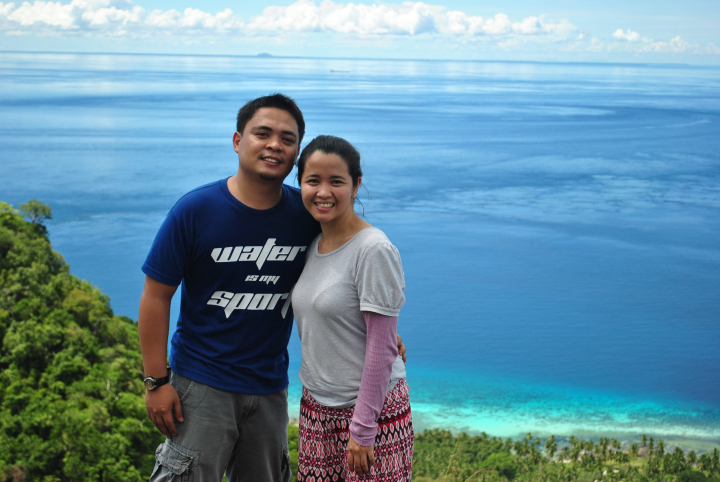 Che and Angel in Catanduanes. Note from the Author: This is my wedding gift to you, Che and Angel. A thank you for making me part of BookSail and for the important things I learned during BookSail Limasawa – that it’s not noble to live a life for others, it is necessary. May you inspire more people to do what you do. To many more seas we’ll brave for the Filipino children.